This outdoor game is a combination of two popular sports with a spiritual twist. 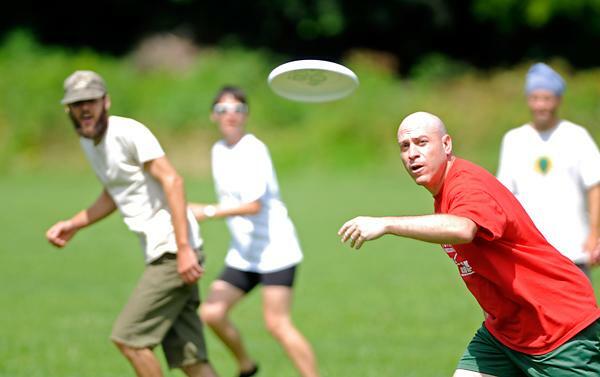 Participants will throw Frisbees (flying disks) toward nine different targets. It’s a little like playing Frisbee; it’s a little like playing golf. The flying disk represents God’s Word, and the targets represent the hearts of those who do not yet know Him. This can be a fun way to talk about evangelism and the importance of the Body of Christ working together to introduce people to God. o Number the notecards one to nine for each team. o Tape the notecards to the nine targets for each team, i.e., each team should have targets numbered, one to nine. o Set out your targets (nine per team) over a large area, preferably with some obstacles (like trees, bushes, buildings, cars, etc) in the way. o It’s important that you don’t make it too easy for them. o Try to make each team have about the same difficulty as the others. o I recommend that you space your targets at least 100 ft apart so that it takes several throws to land the disk on the target. o You can put your targets in numerical order, or you can mix them up to create more difficulty. o You might want to put all your #9 targets in the same place so that it is easy for you to determine who the winning team is. o Divide participants into teams. o What comparisons can you make between this game and getting God’s Word into peoples’ hearts? o What obstacles did you have to overcome? o What might these obstacles represent in our efforts to win people to the Lord? o How did your team work together? o How was this like how the Body of Christ should work together to win those who are lost? o Read 1 Corinthians 3:4-9. How does this relate to the activity? o What will you take away from what you have learned? This scavenger hunt uses images from Isaiah 61 (using the NIV translation). You will hide 48 pictures representing lines from the chapter, and participants will try to find them. This activity is designed for group competition. There are two different sets of participant worksheets at the end of this lesson. You can choose the level of difficulty for your group by selecting either the worksheet with descriptions of the pictures or the one with blanks. If you choose the one with blanks, participants will have to decide which pictures represent each of the different lines from the Scripture and put them in order. o Copies of the participant worksheets at the end of this lesson. Choose either the one with descriptions or the blank version (if you want to increase the difficulty). You will need one copy of the worksheet per team. o Copies of the pictures representing lines from Isaiah 61. (One set per team – you can find these pictures on the Lesson and Material Downloads page at www.teachingthem.com. The name of the file is “Isaiah 61 Scavenger Hunt – Photos.”) There are 48 pictures in the file. Print them in color if you can, but black and white will be fine. o Tape or some other means of posting the pictures in different places. o (Optional) Prizes for the winning team. o Print out copies of the participant worksheets at the end of this lesson (one per team). o Print out copies of the pictures mentioned in the Materials section above (one set per team). o Hide all the pictures around the teaching area, outdoors or in a large facility, where the group can be free to run around. Use the tape or other adhesive to hang the pictures in different places. You can increase the difficulty by hiding them in difficult-to-find places, or you can make them obvious for younger participants. You may choose to put multiple copies of each picture in the same place (one copy each for each different team to find), or you can hide them in different places. o What were your strengths as a team? o In what ways could you have improved? 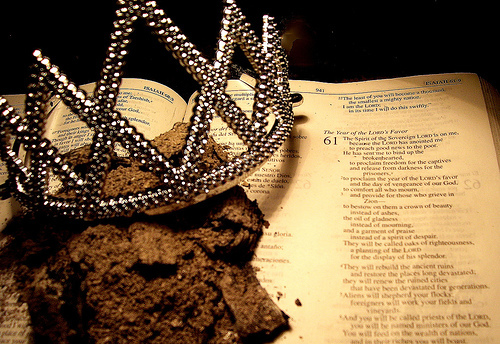 o Do the pictures help you understand the Scriptures from Isaiah 61 in a different way? How so? o Why do you think Isaiah (or God) used so many different metaphors in his writing? o What is your favorite part of the passage from Isaiah 61? o What will you take away from this activity?